Spare a thought for the asparagus farmer subject to the vagaries of our climate. Yes, there has been indoor-grown asparagus for a few weeks now but outdoor grown - and, for me, nothing tastes as good - is struggling with our unseasonal weather. Normally the asparagus farmer has six weeks of frantic activity harvesting the crop for market, then it's all over until next year. Traditionally in the UK the season begins around St George's Day (23 April) and by mid-Summer's Day cutting should stop. The plants continue to put up spears but these are allowed to grow into tall fronds which photosynthesise to build up nutrients for next year's crop. In November the plant is cut back to ground level. It takes about three years for an asparagus crown to become established and, if treated right, will will be productive for 10 years. Quite an investment and hence the relatively high price of those bundles. Asparagus likes well-drained, rich loamy soil - which rules it out for my heavy clay allotment patch. Asparagus needs warm, dry conditions in its final weeks, so it's no surprise that the outdoor-grown crop is late this year. Last year it wasn't at market before the second week in May. This year the delay to the season is even more severe. By 19th May there was still little to be had in London, apart from a small amount from the Isle of Wight - always the first to arrive. My favourite source is that grown by New Park Farm in Kent which is brought up to London for six weeks every years. The care and attention they lavish on the crop is clear and I know of no other asparagus that tastes as good. Freshness is key to taste so, when you do finally get your hands on it, don't let it linger in the fridge. Those spears are packed with beneficial nutrients too - vitamins A and C, folic acid, potassium and iron. So how to make a little go a long way and get the most out of its special flavour? When I get my hands on a bunch of asparagus my first thought is usually how I'm going to cook it. Until last week, that is, when it was served to me raw. Sliced super-fine, mixed with a few pea-shoots and dressed with a lemony vinaigrette and a touch of mint, it was the perfect way to eke out a few spears. I've unashamedly stolen this idea from chef Steve Williams of 40 Maltby Street, though it's my interpretation. It's as close as I can get to his vibrant, seasonal dish. Snap the tough ends off the asparagus. Cut a diagonal slice off the bottom of each asparagus spear then slice each spear as thinly as you can (see result in photo). Add salt and pepper to the lemon juice and mix. Whisk in the olive oil to emulsify. 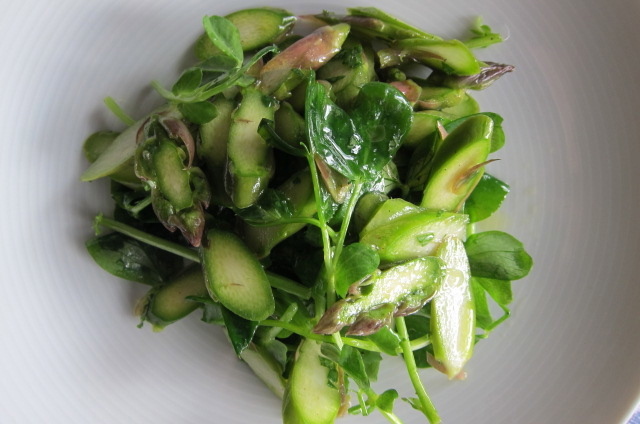 Add the sliced asparagus and the pea shoots. Serve. "All sorrows are less with bread"
Saffron Strands is way of pulling together all the threads of my food related passions. Living in London, most of my postings are London and UK-centric, but I also post comments and recommendations from my travels if I think something will interest you. A pinch of saffron brings a golden glow and sweet taste to dishes from Cornish Saffron Cake to Spanish Paella and Italian Risotto. Spanish and Kashmiri saffron are reputed to be the finest you can buy. The Crocus sativus flower, from which saffron is derived, has one bright red stigma divided into three filaments. Transforming these filaments into the spice is a long and delicate process. The flowers can only be picked by hand and the harvesting, drying, cleaning and packaging is all carried out on the same day to retain quality. The saffron is generally packed in small sturdy glass or plastic boxes, which emphasises the fragility and the value of the spice. It takes 250,000 stigmas to make 500g of saffron. Consequently, it is the most expensive spice in the world, but fortunately a little goes a long way. Generally it's best to crush the strands in a little hot water to extract the full colour and flavour before adding the golden liquor to your dish. Beware, too much saffron makes for a thoroughly unpleasant result. As I learned at the restaurant of a Michelin starred chef when the Saffron Chicken dish I had so been looking forward to arrived almost glowing with the amount of spice used and tasting like a chemical accident. I was far too in awe of the chef to even consider sending it back. It's handy to have a long-suffering partner along at these moments to manfully take it off your hands.